Lime Country, who took over the renowned Think Big property, last year will present a draft of eight yearlings at their second Inglis Easter Yearling Sale. Greg and Jo Griffin previously sold under the Lime Country banner from a property in New Zealand, and have thrived with the shift to Australia. Tell us about your farm, the facilities, and how you prepare your Easter draft. Our property is a lush 300 acres only an hour and a half from Sydney and an hour from the Riverside Complex. We dedicate around 100 acres to spelling stock and pre-trainers and the balance to a nice band of around 50 mares and their young stock coming through for sales. 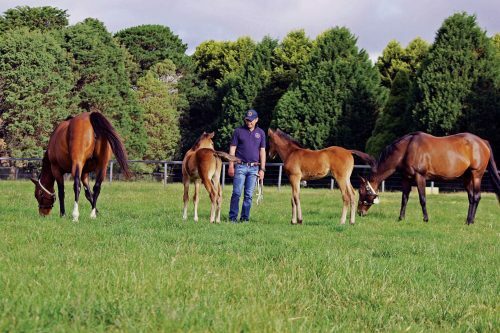 Due to the compact number of mares and foals we are able to spend a good amount of time on education, individual feed requirements and making sure nothing is missed along the way. We offer around 20-25 yearlings across three sales during the year with the Easter sale being our largest individual draft. Name some of your best mares on the farm. Clearly leading the charge is Champion 3YO filly of 2013 in Norzita (O’Reilly), Laylia (Redoute’s Choice) who is now a producer of two stakes winners, Ella Supero (Exceed And Excel) covered by Flying Artie, Gogo Reilly covered by Snitzel, Different To covered by I Am Invincible, and Irish Pipedream covered by Sebring who is headed to the Chairman’s Sale. Have you discovered a new favourite restaurant or hotspotat Warwick Farm? I wish! We were here for the Classic Sale and that was flat tack, so there was not a lot of time for entertaining outside of the sales ground. The food at the Hotel was great. I thought they did an excellent job for a new team under a huge amount of pressure, although they may have under-estimated the thirst of the bloodstock population first time round. What are your impressions of the new Riverside Complex – the stabling, the hotel, the facilities? Fantastic. Greg and I are happy to have a facility like this on our doorstep, literally close enough to the farm any time for us to head home if we need. It’s a facility which has been making news internationally and I imagine the entire Australasian bloodstock community are proud to have such a unique, world class venue added to the sales calendar. In addition, for the value of the stock it will be great peace of mind to take a last walk through the barn before bed to make sure they are all safe and sound. Lime Country have the honour of opening the 2018 sale with Lot 1 – a Redoute’s Choice filly who is a half-sister to stakes winner Kingdoms, and is out of A Real Princess, a winning O’Reilly mare who is a half-sister to three stakes winners including Gr.1 winner Marju Snip, and is from the Candide family. Stallion prospect buyers should be out inspecting Lot 262, as the Fastnet Rock colt is the second foal of Champion 3YO Filly and dual Gr.1 winner Norzita, who is herself a full sister to two-year-old stakes winner Hollows, and a member of the Zeditave family. Lot 355 will appeal to buyers who like to see proven ability, as this Choisir colt is a half-brother to two stakes winners, Thorn Prince and Alinko Prince. Gr.1 sire Hinchinbrook is the sire of Lot 95, a filly from Different To, a young half-sister to Gr.1 winner Dorabella, and Listed winner Crusoe. Lime Country will present two colts by So You Think, who has had an excellent start to his stallion career being currently the leading third season sire. Lot 475 is out of Popcorn Charley, a young unraced Redoute’s Choice daughter of Gr.1 winner Universal Queen (herself a full-sister to Champion 3YO Colt Universal Prince). This colt is inbred 3×4 to the great Sadler’s Wells. Lot 521 is a half-brother to group placed winner of seven races The Peak, out of Cavita, a winning mare from the imported family of dual Champion Older Stayer in Ireland Kastoria. Horse of the Year Dundeel’s oldest crop are two-year-olds, and at this early stage, he’s already left a stakes horse, Irukandji. Lime Country has a Dundeel filly, Lot 490, out of Shoot Fer Love, a half-sister to Gr.1 winner Shoot Out, and Gr.3 winner Cassandara Shadow. Recent Morphettville Guineas winner Silvera is also from this family. Lime Country has two yearlings by first season sires in their draft, including Lot 230, a filly by Randwick Guineas winner Hallowed Crown, and this filly is the first foal of imported USA winning mare Midnight Moment, who is a half-sister to two stakes winners. This is a tough family with many multiple winners on the page.